The #RA series of products brings together a whole range of technical advances which have been made over the past few years. The result is that AABSPEC can now bring you better methods for fluid analysis, ensuring that you avoid the pitfalls and limitations of other methods. And our new window technology greatly extends the available high temperature/ high pressure range. So you can do more and do it better. And get spectral information across the entire range, from the entire sample, even for inhomogeneous and time varying samples. Each model in the #RA series gives you excellent flow characteristics, ultra low, fully swept, sample volumes and variable pathlength. The spectrum is transmission-like and free of interference fringes, so spectral subtraction is simple. All these facilities are packaged in an easy to use, robust and inert format. Connection to reactors or processes is simple and won't interfere with your existing set-up. Choose the #RAX for ambient temperature sampling, ideal for HPLC/IR interfacing with a pathlength range from 0.05mm to 4mm. The #RA4000 gives you high temperature capability and can be used for GPC/IR. The #RA4000-EXP gives you combined high temperature and high pressure facilities (450degC/ 4000psig). If you need a special sample containment material, choose the #RA4000-EXP-S.
Full technical re-print available. 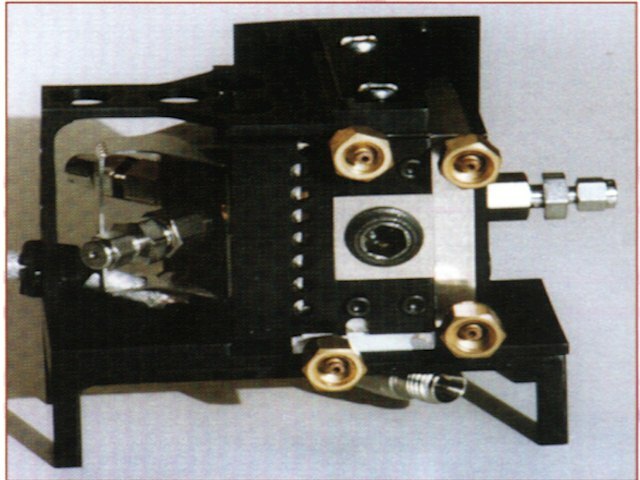 Related products include the #BS-RAM-10K Raman Fluids Cell.